Lin Lang Ai lim Ang Ji Gao Mai? For those too young to have known, or for those who are new to our shores, you might have noticed that Guinness at the local coffeeshops – especially those that look like they’ve seen better days – go by a rather curious name. Ang Ji Gao literally means red-tongued dog, and it is the honorific that the well-loved stout goes by, or has gone by, for the better part of more than a century here in Singapore. 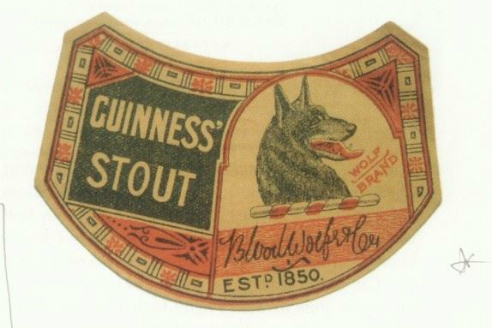 The name was conferred as a reference to the original distributor and bottler here, Blood Wolfe, who used an emblem of a red-tongued wolf on their labels. A picture, they say, is worth a thousand words, and in this instance, three was enough to displace the original name of Ireland’s beloved stout. It won’t be another 140 years before Downton Abbey went on air, so we figure that most of our forefathers could only pronounce Guinness after a couple of pints. Oh well, chicken and egg problems. Even after distribution rights returned to Guinness in the 1950s and the stout was brewed under licence by Asia Pacific Breweries, the name had stuck. Now in the 21st century, the iconic canine has faded into the background, consigned to the recesses of our nostalgia. That is, until its name rings out at a coffeeshop in the heartlands. With the launch of the new Guinness Foreign Extra Stout Limited Edition, the familiar silhouette of Singapore’s well-loved wolfhound returns to the forefront for a limited time. 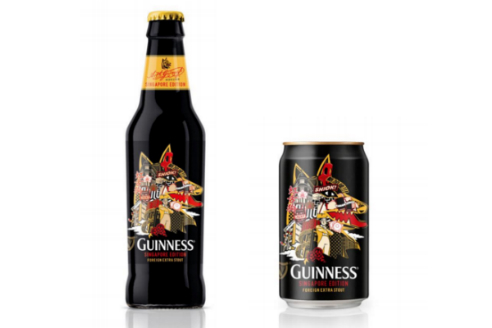 Enter the new Guinness Foreign Extra Stout limited edition, featuring artwork by local illustrator Ben Quek. A celebration of all things Singaporean or ‘singaporeanised’, it incorporates our cultural imagery, ranging from internationally recognisable icons like the Keong Saik Building, Marina Bay Sands, national flower Vanda Miss Joaquim, to ubiquitous high-rise HDB blocks and coffeeshop red plastic chairs and food like kueh tutu. “I envisioned a design that every Singaporean would identify with, and so created a scene of the things we all fondly recognise and cherish as part of our heritage and everyday lives,” said Ben. Together with the launch of the new Limited Edition, Guinness will also be offering prizes including up to S$60,000 worth of home furnishing vouchers to customers who purchase the Limited Edition bottles or cans from now until end May. Three lucky people who purchase a six pack of Guinness Foreign Extra Stout Limited Edition cans and three lucky people who purchase a Guinness Foreign Extra Stout quart bottle at coffeeshops will win S$10,000 worth of home furnishing vouchers each – find the word ‘DOG’ under the ring pull tab or the Ang Ji Gao icon under the crown cap to win it. In addition, you can instantly win a projector pen when you collect any three bottle caps marked with the ‘yum seng’, red chair, kopi bag, kueh tutu, shiok, or Guinness harp icons. The limited edition cans and bottles will be on sale till June, or while stocks last. If you’ve been following Humans of Singapore then this will interest you; Guinness has partnered with the duo behind the site Humans of Singapore to produce a coffee table book titled Men of Singapore – which as you would expect, celebrate the men (it’s a bloke angle thing) who embody the values (good ones of course) that define Singapore today. Look to the Guinness Singapore Facebook page for opportunities to obtain copies of the book. Alternatively you can look for them at the library. *Title roughly translates to: Would you like to have a drink of Guinness?